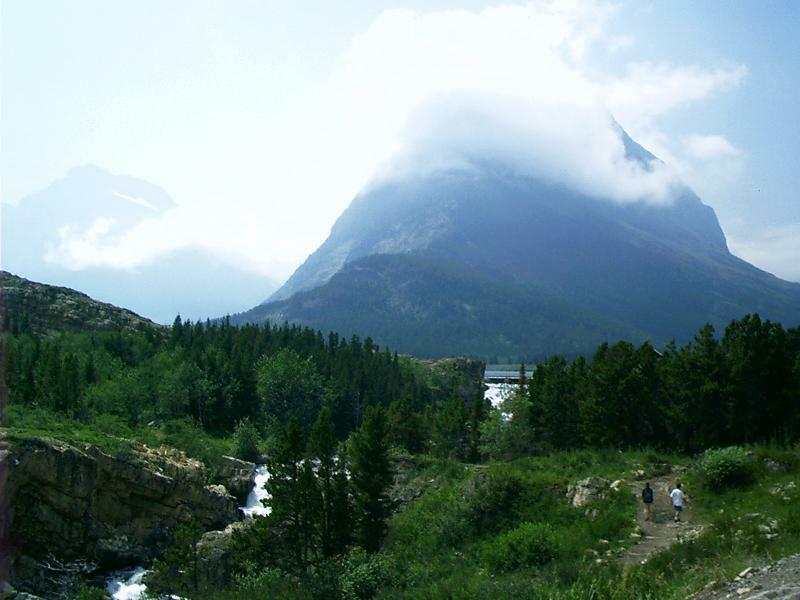 The Many Glacier area is nestled deep within the park just east of the Continental Divide. Take US 89 nine mi north of St Mary, MT, to Babb, MT. 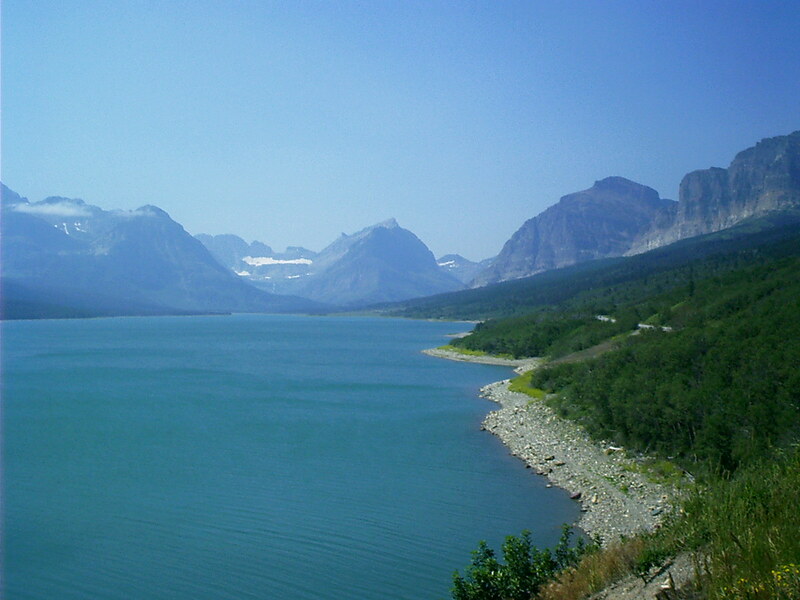 Many Glacier is at the end of a 12 mi access road from there. The Salamander is the ice shelf left of center. It used to be part of Grinnell Glacier (not visible) below it. 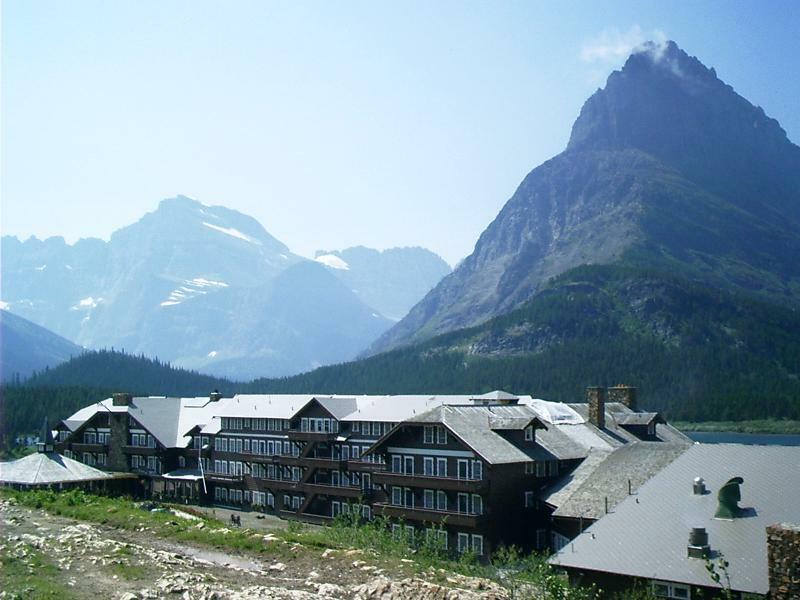 Individual glaciers in Glacier National Park are now relatively small by global standards. Only five glaciers (Blackfoot, Jackson, Harrison, Agassiz, and Rainbow Glaciers) remain in a range of 1.0 - 1.5 sq km, with Sperry and Grinnell Glaciers having shrunk slightly below that to about 0.9 sq km each. An additional five glaciers are currently within 0.5 - 0.8 sq km (Kintla, Weasel Collar, Chaney, Ahern, and Pumpelly Glaciers). Yet, on a regional scale, if one looks beyond the Park, perennial ice and snow of any size is notably scarce. Very few glacierets exist for more than 100 km north in Canada, and none approach the 0.1 sq km minimum glacier size. To the south and west, only 9 glaciers are recognized from mountain ranges within 160 km of the Park (Dyson, 1952). Stanton and Grant Glaciers, are nearest the Park and the largest, currently at approximately 0.37 sq km and 0.34 sq km, respectively. 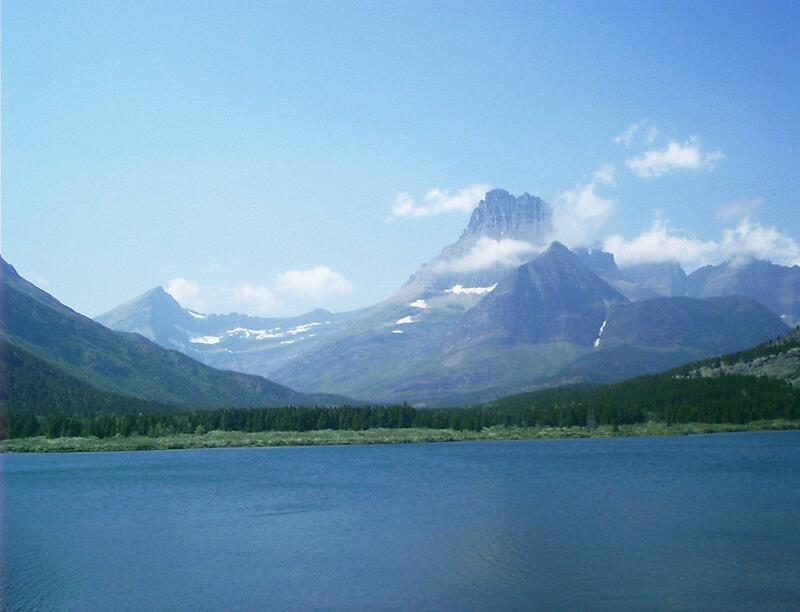 Thus, the complex of glaciers within the Park stands out as an isolated grouping; the greatest assemblage of alpine glaciers in Montana, and when compared to historical distributions, a prime example of glacier recession occurring throughout the Rocky Mountains. About 75 million years ago a vast expanse of rock some 60 miles (100 km) west of here cracked, lifted, and began to slide east. 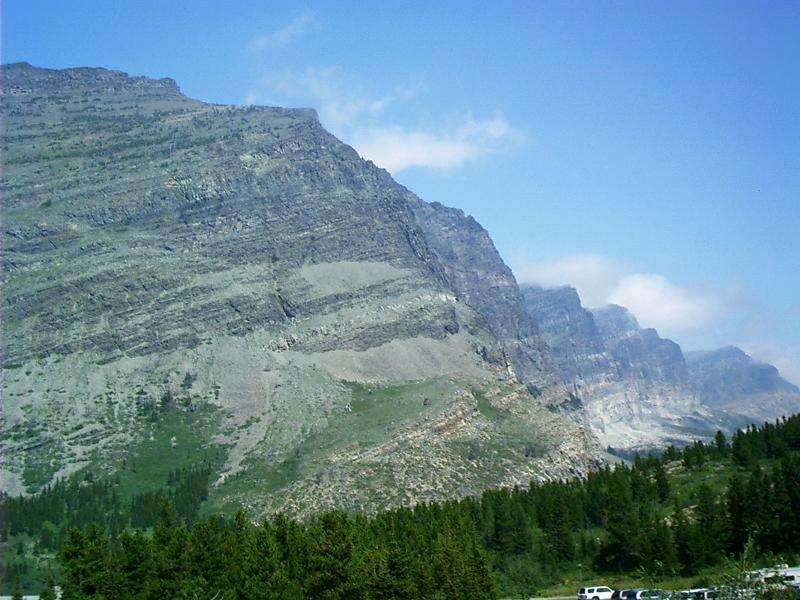 By the time this thrust block stopped traveling it had become the mountains of today's [Waterton-Glacier] International Peace Park. The red and green argilites and pale limestones of the Lewis Overthrust are ancient rock. They began as mud and sediments 1.5 billion years ago in Precambrian oceans. Normally, older rock will lie beneath younger rock. However, here, the Lewis Overthrust forced ancient Precambrian rock over the top of Cretaceous rocks that are just 75 million years old. For an up to the minute look at Mount Wilbur from this point of view, see the seasonal Web cam at http://www.nps.gov/archive/glac/webcams/mgcam.htm. 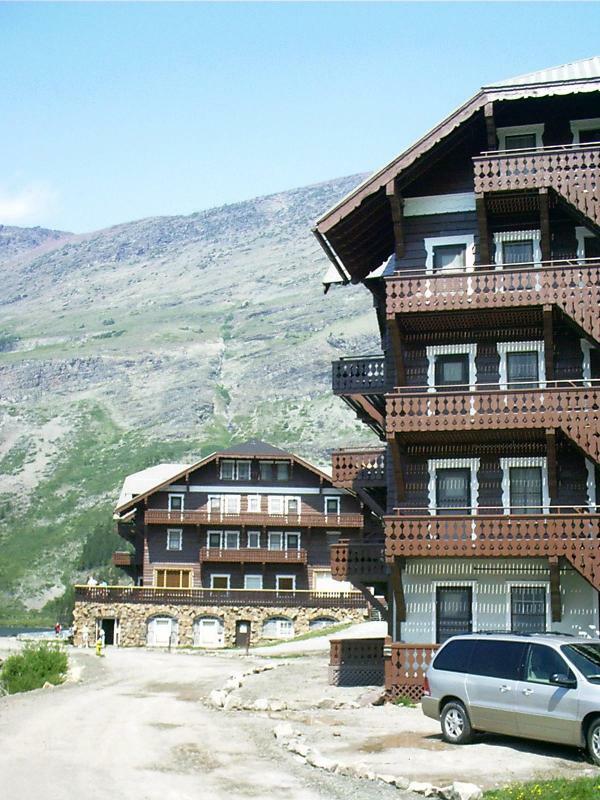 The main wing of the Many Glacier Hotel opened to the public on July 4, 1915. It was one of the Great Northern Railway's developments which include [backcountry] Sperry and Granite Park Chalets and the Two Medicine Chalet (now the Two Medicine Store). 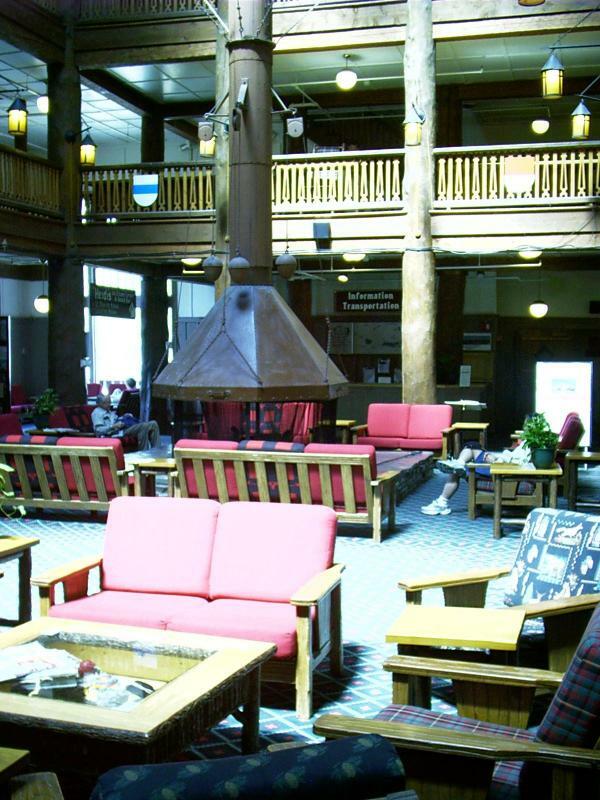 Outside the park boundaries are the Belton Chalets and railroad station at West Glacier and the Glacier Park Hotel complex and railroad station at East Glacier. The Cut Bank, Goathaunt, Sunpoint, St Mary, Gunsight, Many Glacier Chalets and one of the Two Medicine Chalets no longer exist. 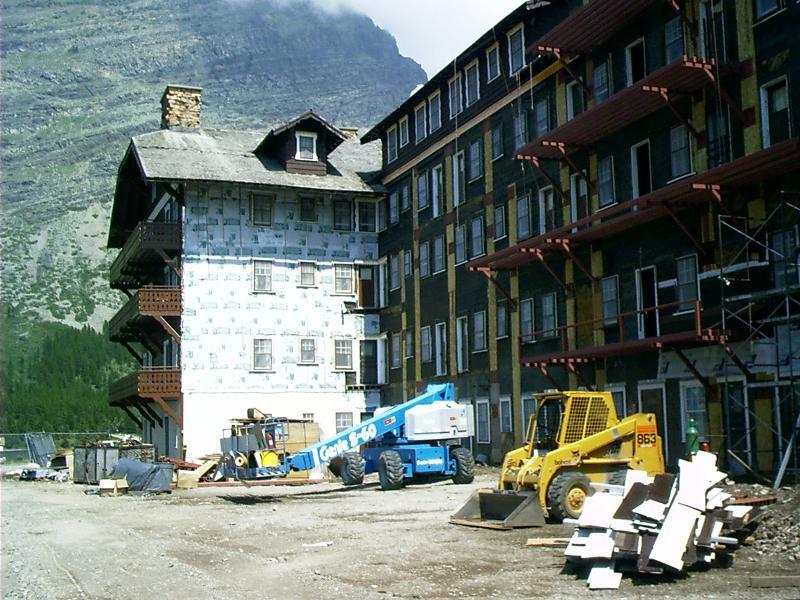 Maintaining these grand old buildings requires ongoing effort, but the Many Glacier Hotel is receiving an extra dose. Major structural work is required to straighten the frame and brace it in some places. Once this is done, plywood sheeting is applied (mostly outside but some inside) to strengthen it. Then the walls are insulated, and the original siding put back up. 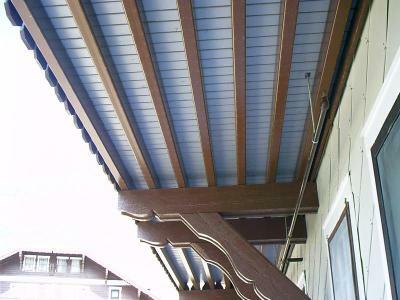 The old wood balconies were unsafe and were being supported by unsightly bracing. Some were blocked off, and many had been removed altogether. They are being replaced with tubular steel. Code variances have been obtained with respect to height that permit restoration of the old look and feel. Rhode, Chuck. "Many Glacier." The Hi-Line and the Yellowstone Trail: To Glacier Park and Back Again. 1 Sept. 2004. Lacus Veris. 25 Apr. 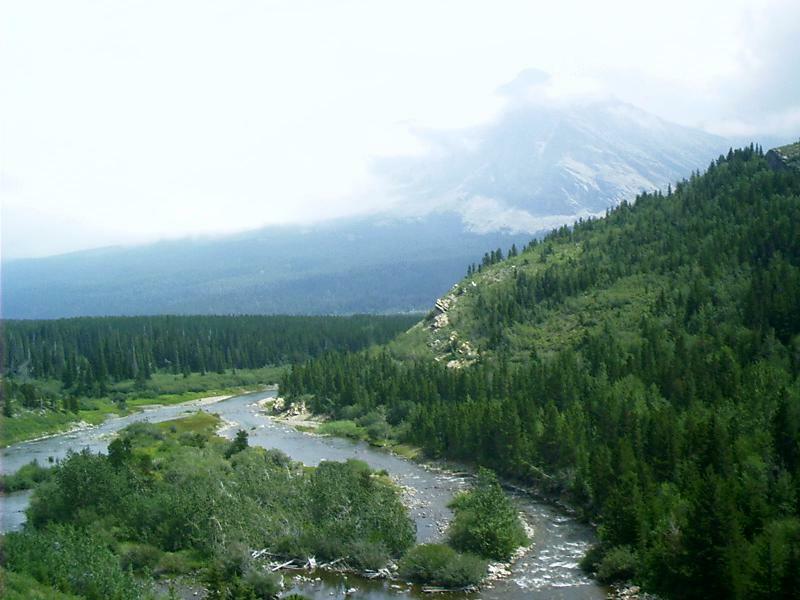 2019<">http://www.lacusveris.com/The Hi-Line and the Yellowstone Trail/The Rockies/Many Glacier.shtml>. Last modified 6 Oct. 2015 . Served 8649 times between 16 May. 2010 and 24 Apr. 2019. Contact ">mailto:CRhode@LacusVeris.com?subject=LacusVeris.